I don't see this as a job, I see it as a way to live. My passion for art and design evolved at a young age and eventually merged into a happy marriage with upholstery, furniture design, and interiors design. I have design and furniture running threw my veins! I love interacting with my clients. Seeing what challenges they have; educating them on their furniture and options; capturing their attention with the enthusiasm I have for my work, and ultimately guiding them threw a resolution to the perfect design. At the end of the day, delivering the product and experiencing my client’s joy in their investment is what I look to achieve in every project. Please give me a call or send me a message. I would love to discuss your ideas further! From concept to completion, the team at Lange Custom Woodworking can provide all your custom cabinetry & architectural millwork requirements for small to large projects. Celebrating 36 years, Lange Custom Woodworking has worked with many prominent contractors, builders, architects, designers, as well as individual homeowners; your one stop source for custom cabinets, furniture, doors, trim, furniture refinishing, and repairs. Also offering in-house design capabilities, and are the premier distributor of Crystal Cabinets of Southeast WI, for semi-custom cabinets. Priding themselves on craftsmanship, service, and dedication to bring you the finest material, the latest innovations, and the very best in cabinet design & manufacturing. No job is too large or too small, from complete millwork packages for homes and commercial projects to minor furniture repairs, and refinishing. Manufacturer of hydroponic Living Walls for hotels and commercial environments, and Church furnishings; Visit our website for additional information. Classic Wood Boat Restoration is another of their many talents, with over 100 trophies to their credit. Many of their restorations have graced the covers and stories in Classic Boating magazine, the Chris Craft Boat Club magazine - the Rudder; as well as judged competitions at numerous wood boat shows in the Midwest. Thank you very much for your interest in Lange Custom Woodworking! We are an insured and bonded, family owned and operated business. Our craftsman have over 50 years of experience customizing and manufacturing designer slipcovers, upholstery, window treatments, and furniture and accessories including ottomans, cushions and pillows for homes, offices and restaurants. We have thousands of fabrics to choose from or will work with any fabric provided. We love working with both homeowners and interior designers. Contact us for your next project! I'm a Master Upholsterer with 25+ years of High End furniture experience. Since 90% of all work is done exclusively by my own hands, I tend to receive top tier clients by word of mouth. In this field you truly get what you pay for, not all shops work with a conscious and not all trades people can dedicate the correct amount of quality time to every piece of furniture. I'm not the most economical but I'm extremely good at what I do. 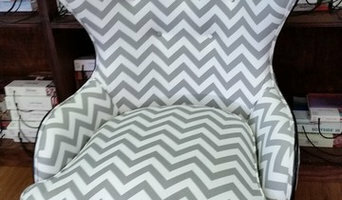 I had been doing upholstery for more than 35 years, learned the trade at my father's shop. Started working in the custom furniture manufacture in 2002 and making furniture prototypes since 2004. Whether you are an architect, designer or homeowner Time Treasures Restoration and Upholstery is able to assist you with restoration, repair, and custom upholstery needs. A family owned business with over 100 years of accumulated experience in refinishing and restoration of furniture, doors, cabinets, and upholstery. Homestyle Custom Upholstery is dedicated to providing our customers with quality upholstery services at competitive prices. We offer over ninety years of combined expertise in upholstery repair and renovation. Each piece is lovingly and meticulously returned to its original glory. Come visit us for a commitment-free consultation, and learn more about our customized upholstery services. 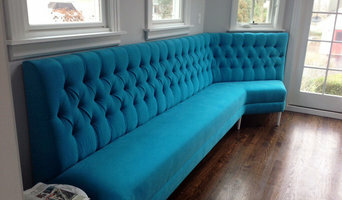 V Upholstery Inc is your premier furniture and accessories professional in the Lake County, IL area. 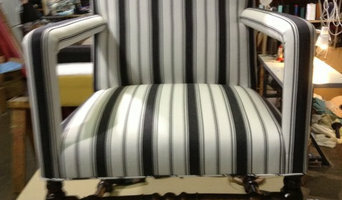 Specializing in all types of furniture reupholstery, furniture touch ups as well as window treatments. V Upholstery started in 1989 after working part time at an upholstery shop in high school. We are experts in what we do, and Vince does all the work himself, exceptionally and on time! The final results of our projects are the best part, to see the transformation of a piece of furniture, or how a room looks with a newly refurbished chair. Vince says his favorite thing about working with clients is communicating with them about the project and giving input, while listening to what they want. He also enjoys getting to know them. Everybody has an interesting story! Vince enjoys yoga and finds that the concentration from yoga keeps him patient on intricate projects. At V upholstery we strive to communicate honestly and in a trustworthy fashion. Our services include, free design service, free measuring and if you qualify free installation. Our in home estimates are always free, we never charge to come to your home or office. We supply the customer with all the top notch services that you would expect from a company that has been in business for as long as we have. Soonic booths Professional Upholstery we give to our customers the opportunity to think, design, & modify any piece of furniture to meet your every need. who's in our team Experienced workers in upholstery, carpentry, sewing varnishing, their experience extends from year's and it even generations. craftsmanship, attention to detail, and customer service are our top priorities. At Soonic Booths NO job is too big or too small. From reupholstering booths to creating custom restaurant seating we have experience with almost every aspect of furniture design. Commercial clients may take advantage of our on site work for restaurants, hotels, & office spaces to meet every customer's needs. 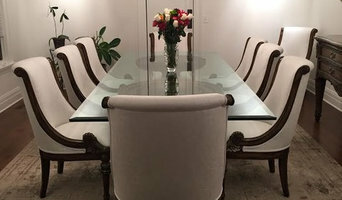 Home furniture repair companies in Libertyville, IL are in the business of rehabilitation; they repair, refinish, restore and reupholster broken — but beloved! — furniture. It is usually more cost-effective to repair furniture instead of buying new pieces, so whether you’re looking for leather couch repair services or custom upholstery, these professionals can take your furniture from broken to beautiful. Re-upholstery/upholstery repair includes redoing/outfitting items like chairs and sofas with springs, padding and fabric coverings. This can also include adding fringe, piping, tufting or additional decorative elements to a furniture piece. They can also advise you about the pros and cons of different fabrics so you can choose the best type for the project in your Libertyville home. Find Libertyville furniture repair professionals on Houzz. Narrow your search in the Professionals section of the website to Libertyville, IL furniture repair.